The Second Church of Christ, Scientist, was completed in 1901, two years before the completion of the First Church of Christ, Scientist, on the northwest corner of Central Park West and 96th Street (see The City Review article). Designed by Frederick R. Comstock, the Second Church is notable for the green dome atop its squat neo-Classical base. The First Church, designed by Carrère & Hastings, is a much more monumental edifice of very imposing grandeur with a high steeple. is a monumental edifice of very imposing grandeur. In their excellent book, "New York 1900, Metropolitan Architecture and Urbanism, 1890-1915," (Rizzoli International Publications, Inc., 1983," Robert A. M. Stern, Gregory Gilmartin and John Massengale describe the Second Church as "a densely composite synthesis of historical allusions, [which] was an inventive response to the task of representing a creed with no specific architectural heritage." "The side street and avenue facades," they continued, "were of different lengths, but each was a tripartite composition based on a heroically scale arched window with a pediment above and flanking corner piers. The similarity of the facades reflected the square proportions of the auditorium within, and implied a centralized plan which alluded to the humanism of the Italian Renaissance. The exterior detailing combined fashionable Modern French ornament with the severe proportions of the neo-Grec. The interior was contrastingly sober; the sparsity of its ornament recalled the frugal London churches of Sir Christopher Wren." "Carrère & Hastings's evocation of the low church architecture of Georgian London and New England set the tone for many subsequent Christian Science churches throughout the northeast. Carrère & Hastings achieved a remarkable sense of soliditynot only through the blocky composition, inspired by the English Mannerist architect Nicholas Hawksmoor, but also through the use of extremely large blocks of a white Concord granite, a stone so hard that it shattered mechanical saws and had to be cut by hand. Inside, the church was less distinctly English in feeling. A gallery wrapped around three sides of the auditorium, and barrel vaults sprang from piers which barely cleared the galleries, creating a powerfully encompassing effect. The room was largely undecorated, except for an elaborate organ case and rich Modern French plasterwork on the ceiling, which also contained roundels of concealed lighting. Supported above the auditorium arches were the church's offices, reading rooms and extensive Sunday school facilities. Clearly expressed on the exterior, their location reflected a unique solution to the problem of the parochial complex. Owen R. Washburn was correct in his assessment for the Architectural Record: "if we may not speak of a cathedral, in this case, we surely possess the metropolitan church." The Christian Science Church was founded in Boston by Mary Baker Eddy after the Civil War and emphasized healing through faith. Mrs. Eddy appointed Augusta Emma Stetson in the 1886 to establish a branch in New York City. In his superb book, "New York Streetscapes: Tales of Significant Buildings and Landmarks," (Harry N. Abrams, Inc., 2003), Christopher Gray observes that Mrs. Stetson apparently was quite "contentious." "When the Second Church of Christ, Scientist bought a building site at 68th Street and Central Park West in 1898, she tried to interfere with their purchase, and then purchased one two blocks south, to try to scare them away from what she thought was First Church's neighborhood. When Mrs. Eddy died in 1910 she left a bequest to Second Church, but not Mrs. Stetson's organization. In 1909, while still head for First Church, Mrs. Stetson was excommunicated from the Mother Church in Boston and then left First Church. 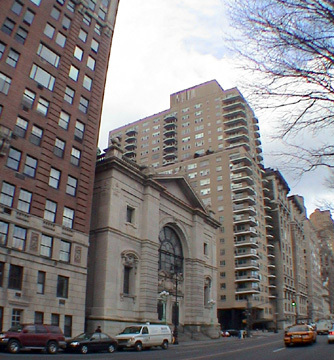 However, she remaied in her house next door at 5 West 96th Street, successfully suing First Church in 1923 to preventit from erecting a wall that would cut off her east light. She died in 1928." In their great book, "The A.I.A. Guide to New York City Architecture, Fourth Edition," (Three Rivers Press, 2000), Elliot Wilensky and Norval write noted that "The architects of the Beaux Arts-style New York Public Library at Fifth Avenue and 42nd Street flirt here with the forms of Nicholas Hawksmoor's great Baroque churches in London. Exciting." In 2003, First Church announced its intention to sell the church.